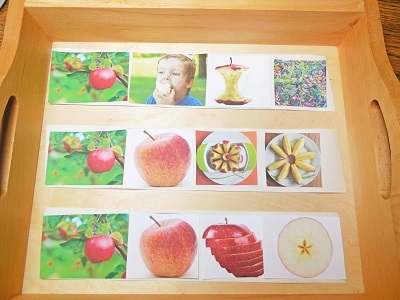 Teaching the abstract idea of time to children can absolutely be accomplished by using common household items and discussion. Obviously, the discussion and learning will be ongoing as children grow and learn. 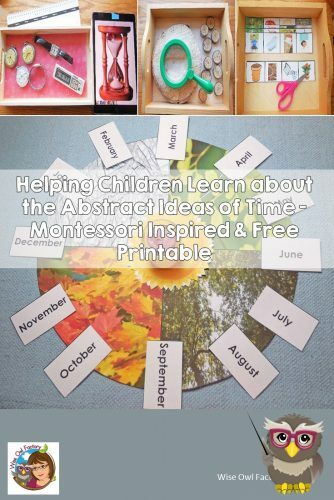 As I finish the year long online KHT Montessori class, I am studying the last manual — history. Karen Tyler Hanson is a masterful teacher and has been coaching us through our learning. I could have just purchased the manuals separately, but I was glad I opted to include the forums and her help. She is a brilliant woman. I was pleasantly surprised by the history manual as I was hoping it would not be about past wars and issues. 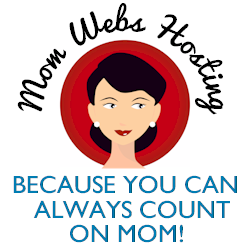 It was not and has lessons and resources appropriate for young learners. Of course that would be true, but I had never read the manual before. 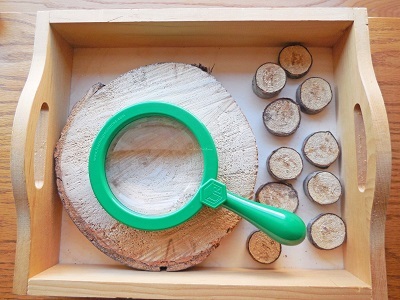 Montessori isn’t as predictable as one might think and I am still surprised and learning so many things. 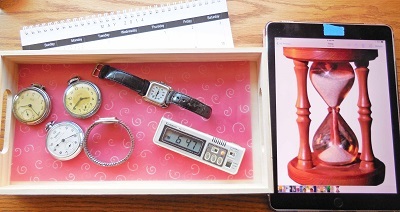 Beginning with objects found inside the house such as watches, calendars, and timers will help children start to realize they are used for measuring time. Outside the house, there are more ways to see that time has passed. 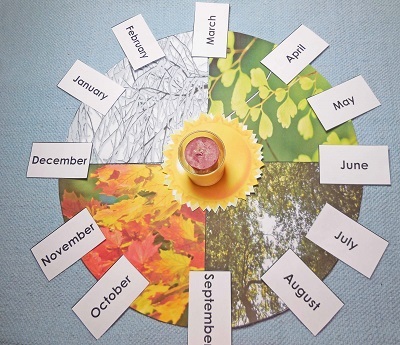 A tree slice shows the concentric circle of each passing year. Children can view these using a magnifying lens and ponder this fact. Discussion of the reasons some rings are different thicknesses can also happen with this activity. Outside, there are probably many natural things to notice that show time has passed, such as planting and observing a garden. 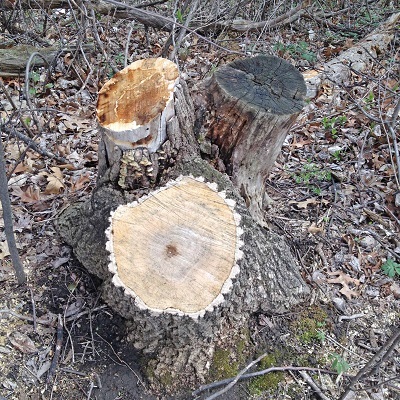 Here we found a tree with 3 separate trunks that were cut down at different times. It is easy to tell which truck was the most recent one to be sawed off. 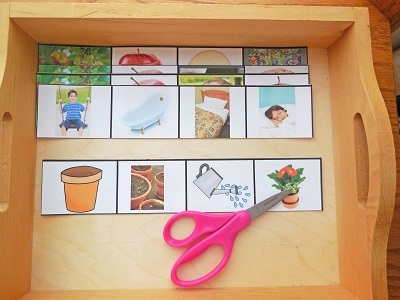 Sequencing cutting strips of 4 per row can be used simply as cutting strips for scissor skills. These are included in the free printable. 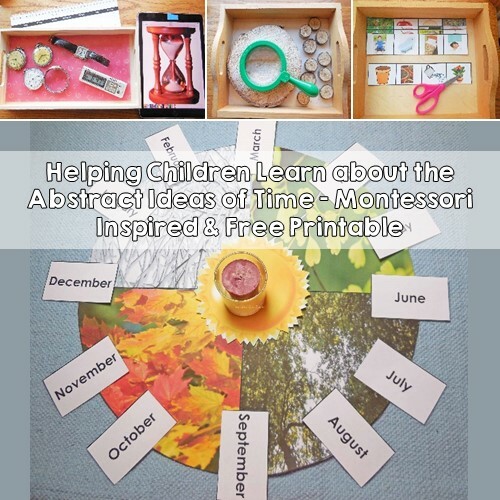 The Montessori Walk Around the Sun activity for birthdays was one of the things I noticed online that drew me to take Montessori classes. I wanted to learn about that first and forgot about it as I started reading the manuals. It was one of the last things I learned about this year. The items in the next photo are also included in the free printable. There are two other options for the months labels, so print only the pages wanted. I hope you enjoy this PDF and the children you teach.